Our favorite W.W. is back! 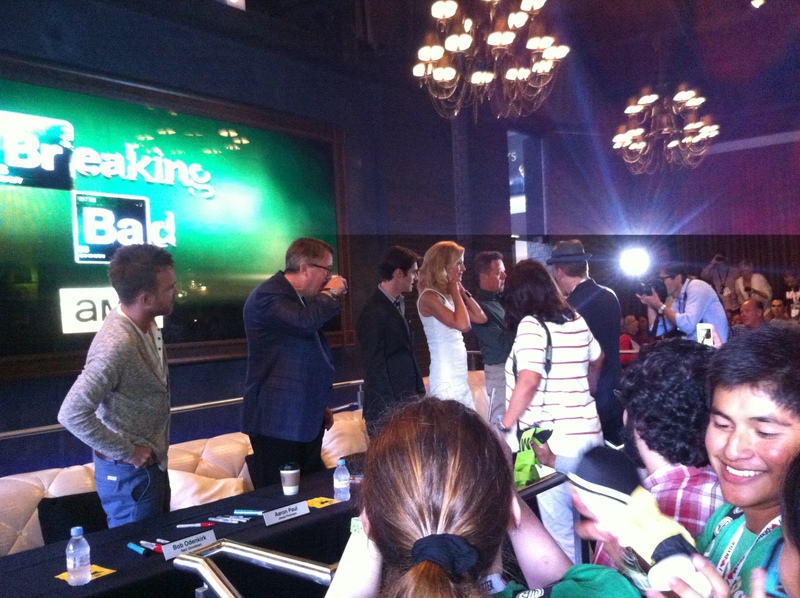 I won a Twitter contest to get into the Breaking Bad Fan Appreciation Party at San Diego Comic Con 2013. 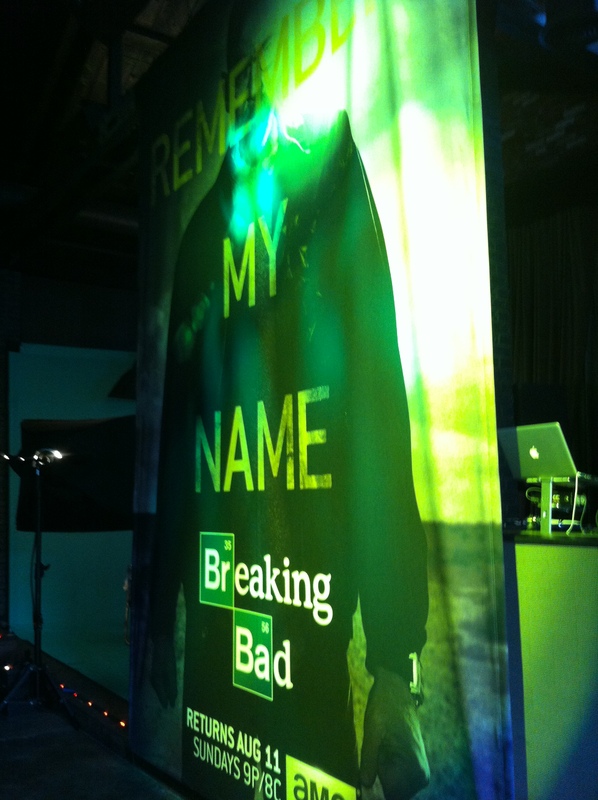 You had to be one of the first sixty people to tweet using the hashtag #BreakingBadCC. Originally, I had been put on an alternates list, but about a week before the party, someone contacted me to let me know I’d been put on the guest list. Therese showed up like two hours early and was essentially first in line when I joined her around noon – we were told the party would start at approximately 12:30. So we waited… and we waited… and we watched some girl cut in line (she was cosplaying Walter White from the pilot episode, you probably saw pictures of her). Personally, I found it to be a little bit chaotic and disorganized if we’re being honest. Not to mention, Therese asked for a wristband to prove that I could drink and some lady yelled in my face, “She’s not twenty one!” I’ll actually be twenty three in October… and I did get my wristband, thank you very much. Therese got cozy with this sign after a couple of hours of waiting. Somehow, they managed to let about five of us “winners” in, where we proceeded to stand on the patio at The Hard Rock for another hour – just the five of us. Everyone else was still in the line we’d initially been in and where we would have had a front row seat to see the cast come back from the panel and enter into the Hard Rock. I could still see them coming in and I didn’t mind much because I was going to meet them. It was still a wait, but that’s the theme of Comic Con as a whole, isn’t it? 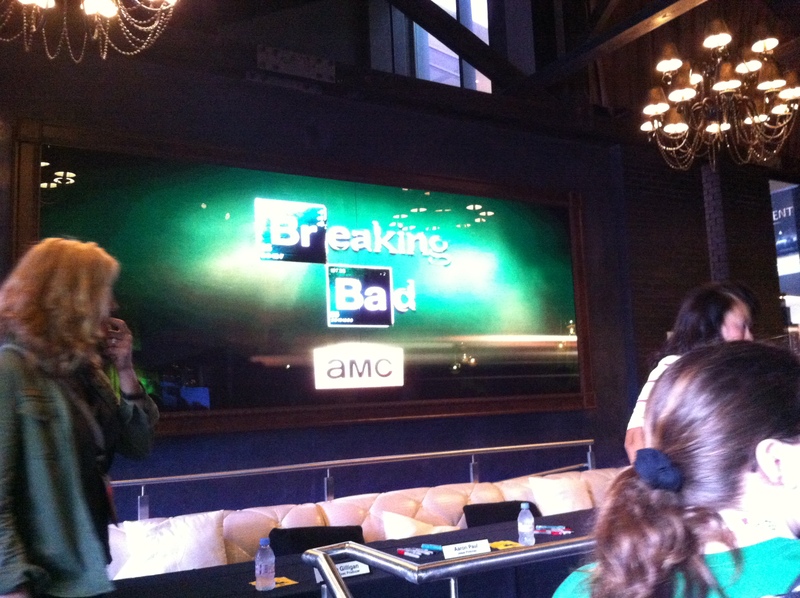 After the cast came out, I was handed a Breaking Bad poster and a Walt Whitman book of poems. Bob Odenkirk signed my poster twice – once in red sharpie and once in silver so that it could be seen. Aaron Paul was fantastic, but I moved along like we were in a line up, only to realize once I was chatting with Anna Gunn that it was literally just me and the guy in front of me standing up there with the cast. My one regret is not shamelessly hitting on RJ Mitte while I was there, but Anna and I were talking about how intimidating Hall H is and she is seriously the sweetest woman. I felt guilty about not liking her character on the show after talking to her. She’s also the only one who didn’t sign her name near her picture on the poster (except for Vince Gilligan, whose picture wasn’t on it). Some poorly taken shots of the cast by Therese. Before the cast were brought in and the insanity ensued. 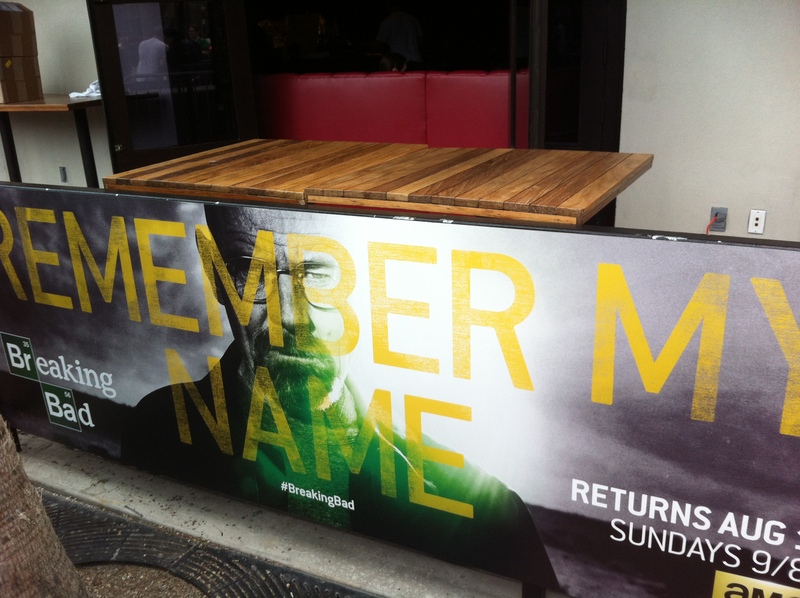 I was really excited at the prospect of going to the Breaking Bad party this year. I’ve been a fan for about a year, after speeding through the seasons, I was pumped to go to the party, even if I was just Kylee’s plus one and got to hang out with some other fans. Like Kylee said, I got there about 2 hours in advanced and stood at the front of the line waiting for Kylee to meet up with me. Being a Sunday, I was pretty much free for the rest of the day, so I sat there patiently as people started to turn up. After the line was about over 100 people long and after Kylee turned up, we all checked our watches for the time before a girl walked into line and stepped right in front of us. Yeah, I appreciated that… LIke I appreciated her trying to make conversation with us after stepping in line in front of over 100 people. I wasn’t as angry as some people in the line should have been. Anyways, after going over like half an hour of the schedule, the VIPs are let in. I walk in right after Kylee, she takes a left into yet another line and I walk into the party. The empty party that I turn around to see no one has followed me into. Turns out I slipped past the security and ended up getting in before other people. I didn’t actually feel bad about this until like an hour later and I see people still standing out in the sun and I’ve finished my second plate of chips, guac, and salsa. Awesome set up before the crowds were let in. Because I accidentally got in, I was able to take some pretty great shots of the party on my phone. Set up at the Hard Rock, they had the place totally decked out for the party, even with their own exclusive Blue Sky margarita. 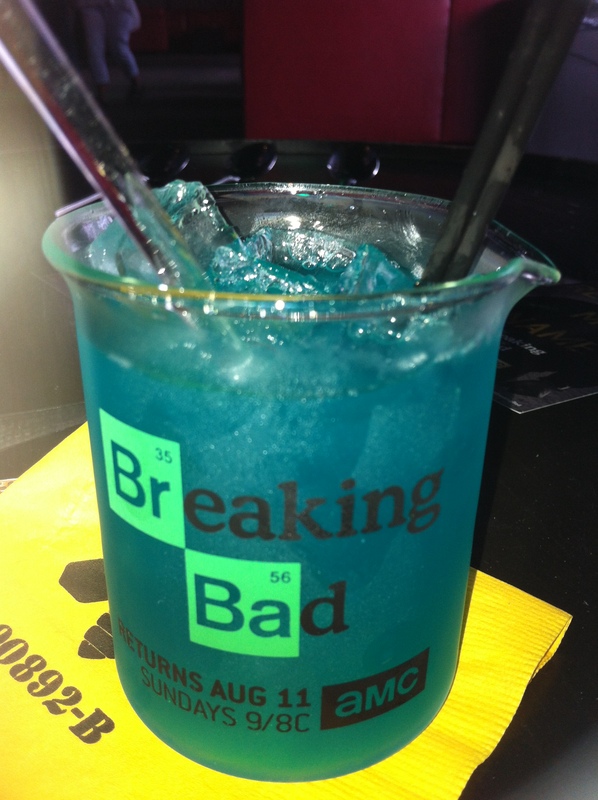 The bartenders were dressed up like Jesse and Walt in their suits and were serving drinks out of Breaking Bad beakers with glass stirrers. After we left we were given party favors of test tubes with Blue Sky “meth”/rock candy flavored cotton candy. 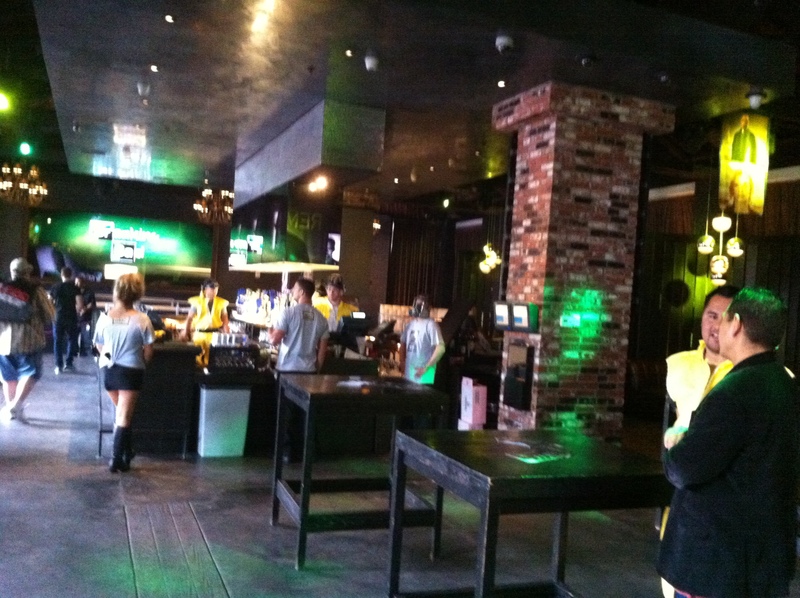 I have to say, having never been in the Hard Rock, this was a pleasant first time… for me. Personally, the space was way too small. It could not have been more crowded once they let everyone in. The people crowding the front of the signing area was meshed with the people waiting at the bar and the people standing in line to take pictures as Jesse and Walt (yes, they had an area where you could dress up as our favorite chemists and take photos with your friends, I love it. Too bad the line was absurd). He was so much happier before they opened the flood gates. Well, once they let everyone in it was basically impossible to maneuver and make my way around. They showed the pre-credits scene on the projector screens and prepped some cool swag, but the wait was absolutely insane. I don’t think I could have enjoyed this if I hadn’t been let in an hour ahead of people and been allowed to get an alcoholic beverage in my hand and some food into me. 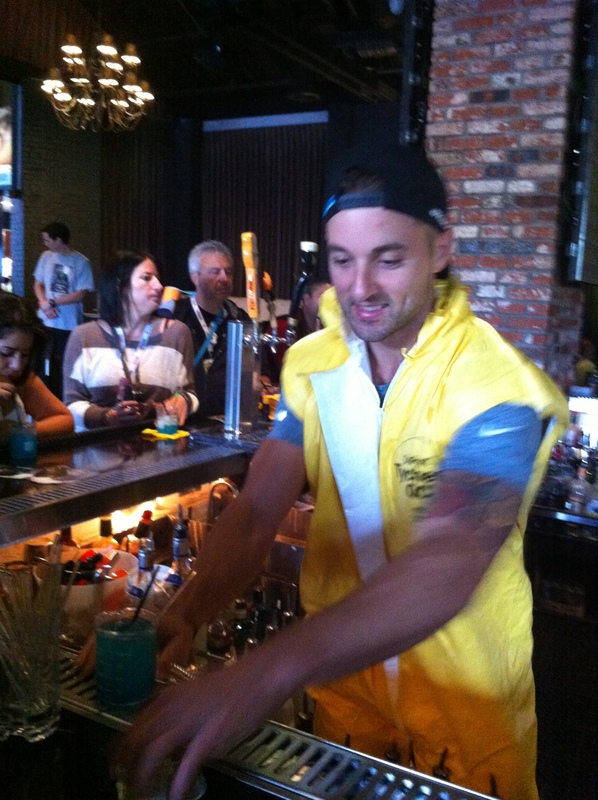 Being a pretty seasoned goer of SDCC, this was my first party. It was fun (especially being in there alone) and enjoyable, but overall, very much a test of patience and convictions. It was awesome getting to see the cast, and the signings were very lax. They signed stuff from the crowd, took pictures, and took time for each person who had been waiting in line. For an end of SDCC bash, it was a great way to end the trip. It also got me pumped for the premiere that came out today!